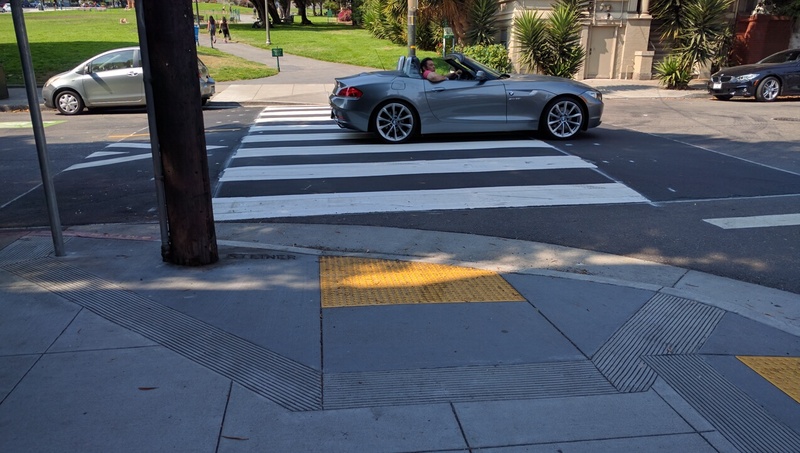 Streetsblog was thrilled to hear about the quiet unveiling of San Francisco’s first raised crosswalk on a through city street, at Steiner and Hermann, across from Duboce Park. For a safe-streets advocate, raised crosswalks represent a clean break from the auto-über alles perspective that has so dominated our streets. By keeping the crosswalk at the level of the sidewalk, it sends a message: this is pedestrian space. Motorists–yeah you! Slow down! Be safe. Because if you try to race across one, not only are you going to drop your cell phone and spill your latte, but you might even damage the undercarriage of your car. And unlike a normal speed hump, raised crosswalks slow cars down exactly where they should–where walkers need to cross. Now, technically, the Duboce Park crosswalk isn’t the first raised crosswalk in San Francisco–but the existing ones are on backstreets, such as Pearl where it meets Market. The handful that exist are in low traffic areas/places where cut-through traffic can be hazardous, such as in the designated “home zone” around Marshall Elementary in the Mission. There’s also one on Nancy Pelosi Drive, but that’s deep inside Golden Gate Park. And there’s one other that sometimes gets overlooked. More on that below. Up until now, raised crosswalks have been restricted to low speed “home zones,” such as this one at Adair and Carr. Image: Google Maps. The raised crosswalk on Steiner Street, connecting the sidewalk of Hermann with Duboce Park across the Wiggle, is the first one–far as we know–that bridges across a fairly heavily trafficked through street in the middle of the city. And it’s a place that screams for a raised crosswalk because of the connection to the pathway in the park. Which is all great. But, alas, it has some unfortunate compromises. “The crosswalk at Steiner & Hermann is extremely shallow. It doesn’t seem high (or “humped”) enough to actually slow down passing cars,” wrote Cathy DeLuca, Walk SF Program and Policy Manager, in an email to Streetsblog. In other words, this “raised crosswalk” is not a continuation of the sidewalk. There are still ramps from the sidewalk on Hermann down to street level, then there’s a shallow climb back up to the level of the “raised” crosswalk, which is barely above street level anyway. Same on the other side. “I wouldn’t even call this a raised crosswalk,” wrote DeLuca. Another angle on the raised crosswalk to Duboce Park. Notice no brake lights on the back of the truck to the right. That was typical. Photo: Streetsblog. For motorists and cyclists, it’s a very gentle gradient up to the crosswalk level and back down the other side. And, perhaps not surprisingly, Streetsblog observed car after car speeding over the crosswalk, with few if any motorists touching the brake pedal. And what about the other raised crosswalk referenced above? One doesn’t have to go to Denmark to see a full-blown raised crosswalk on a busy street. Ironically, there’s one on 20th Avenue in the Stonestown Mall. It’s perhaps the only mid-block (maybe mid-mall-parking lot is a better moniker?) crosswalk we’ve seen in San Francisco where motorists consistently stop for pedestrians. The height of the crosswalk is exactly level with the sidewalk, which defines it clearly as pedestrian space. The ramps are just steep enough that it’s no problem to bike over, but a motorist who doesn’t slow down gets an uncomfortable bump. 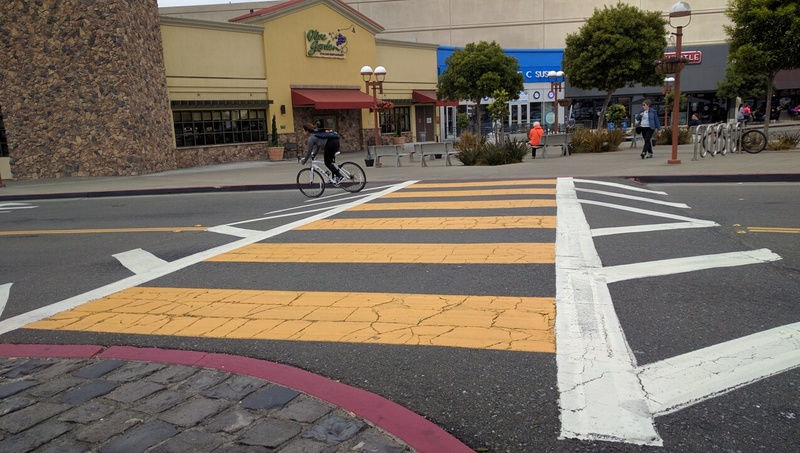 How much did the Stonestown Mall crosswalk cost? Can its design be copied and dropped elsewhere? Streetsblog is trying to find out. 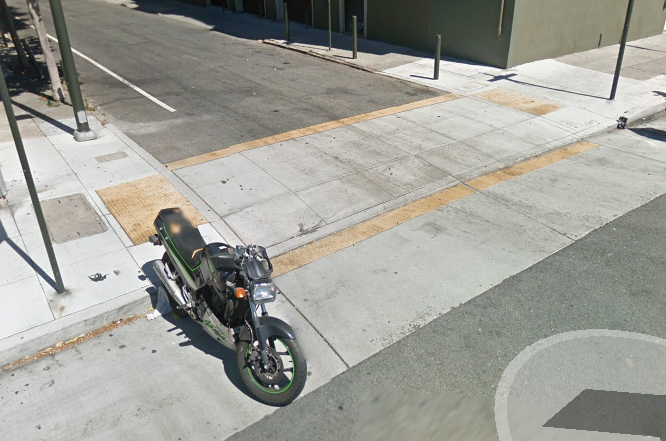 Post or send us shots of your favorite–or most hated–pedestrian crossing locations at tips@sf.streetsblog.org. And be sure to comment below on what treatments work and what don’t at these intersections. 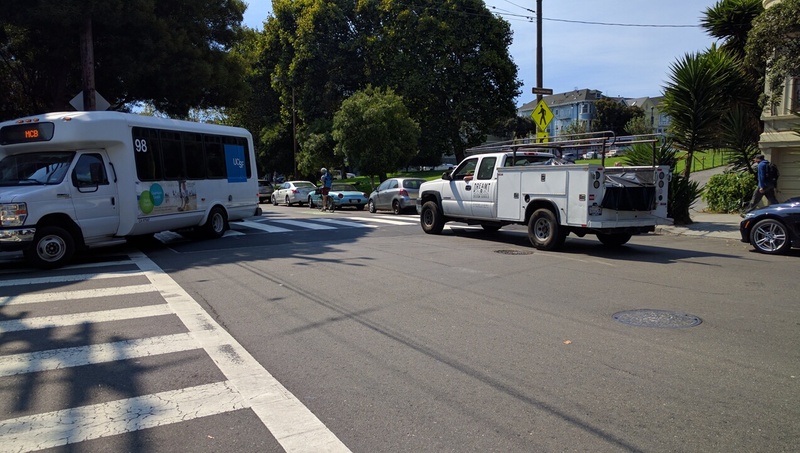 As to the Duboce crosswalk, let’s hope SFMTA can figure out how to fix the drainage problems–and get it up to curb height–without breaking the bank. $110,000 seems an awful lot, hope it can be done more cheaply. I use this crosswalk frequently. I was skeptical at first, but in addition to the grade level raise and the new white graphics, it actually does seem to slow people down. Glad the quick and easy has been built here (even thou it’s pretty pitiful) but the 110k for the full build-out sounds like some contractor pork to me. Requires “extensive design, overland flow analysis” ? Just don’t block the gutters. Use metal grates over the gutters. Done. The problem is that the city has to competitively bid the project and the contractor has to use Union folks and meet living wage requirements, etc., etc. Private projects don’t have these additional hurdles to jump and can be done much more cheaply as a result. So probably, the price is that high! I’ll buy that water drainage issue requires more study and jacks up the price. What if we did smaller humps on either side of the crosswalk so drivers notice? I think the biggest issue here is that it being at the bottom of the wiggle (creek bed), an actually raised sidewalk could present drainage issues. Let’s take out all the pavement in the city. Some of us won’t be able to drive and some won’t be able to ride their tricycles any more. Is that your ultimate goal? Lets all drive our cars on sidewalks and get “rid” of all pedestrians in one go. Then we can drive at whatever speeds we want without ever having to slow down for cross-walks. This week I was hit by a car while using the crosswalk discussed above (yes, seriously). The $110K it would’ve cost to implement the proper design is slightly less than what I’m anticipating in medical bills over the next six months. I also wont be able to walk my dog to Duboce dog park or wiggle my bike by there for a long time. Vote for the Bay Area's Best Street Treatment Quick Fix. Which of these (or other nominations) should get a Streetsie?